Hi, my name is Cindy Losekamp. Thank you for visiting my brand new Web site. This site is a dream come true. I hope you will visit often and see all the new things that will be coming in the near future. There will be free downloads, project ideas, pictures of my students from some of the places I teach, and all kinds of fun and exciting ideas for creating. I have been sewing since I was a little girl, in fact, I can’t remember not sewing. Of course, I come from a sewing family. My Grandmothers both sewed, my Mom sewed and…my Grandpa, my Dad and my Brother sewed…So it’s no surprise that I married a man who sewed when he was young and I raised four sons who all know how to sew. You’re right if you are thinking that I don’t have any daughters. Five males and me…you can imagine that I was definitely outnumbered. I hope someday to have daughters-in-law to spoil and I’ve put my order in for granddaughters, too. Okay, what is the reason for this wonderful web site? Many years ago I took a job in a sewing machine store (imagine that!) and after a little while, I became manager. Besides the day to day business of selling sewing machines, I was fortunate to be able to teach lots of classes in everything from basic applique to free motion embroidery. The more I taught, the more classes I devised. Because of the nature of my job, I was able to attend most of the sewing machine conventions and study with many dynamic and creative instructors. Learning from the best just gave me more ideas about using the machine creatively. After working with the company for awhile, it became my job to coordinate the classes and create and write the newsletter for the three stores where I worked. So naturally, I was always playing catch up…I think I thrive on pressure. In the fall of 1993, I designed a class called ‘Trash Bag Quilting’…in my head of course…no time to make a sample until after I finished writing the mailer and then, I would create it. What I had in mind was, laying bits and pieces of fabric on a background and placing a sheer overlay over it and then practicing the techniques of creating and modifying stitches. Somewhere in the middle of the night, my trash bag quilting became landscape art. What do you think? After the class, I put the notes and the sample away and didn’t teach it again. 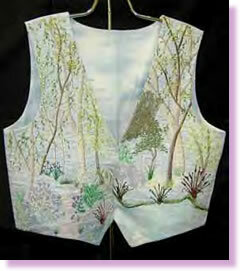 Then in 1997, I was asked to teach at the Sewingly Yours, Pfaff retreat put on by Marilyn Bond in Canada. The first year I taught machine beading and, having been asked to bring samples of some of my other works, I took landscape art. Well, everyone wanted me to come back the following year and teach a class on the vest. Of course I accepted the invitation…but what was I going to do…I only had a few notes for a very involved project. Finally I decided that I would write a book, detailing the methods of it. I would print it on my home computer and have it bound…so I did. I guess I don’t need to tell you that the letter changed my life…My life, my husband and children’s lives and possibly, some of your lives. That one letter has had a ripple effect that has continued to amaze and delight me. After the letter hit the lists, that same evening I had 29 letters in my mailbox requesting the book. The next day I had dealers calling, wanting to order six books, twelve books, and twenty-four books. Remember, I had no books left from the seminar so I had nothing to fill the orders that kept coming in…I didn’t know what I was going to do…and then my husband said those magic words…”I’ll help you.” and we were in business. Well, it wasn’t too bad, once we got used to it. I continued my job in Cincinnati and my husband continued milking the cows and we kept publishing books…but I continued getting inquiries about what I was going to do next. “Next? You want me to write more books?” So I began my second book, but here is where it gets interesting…my husband flatly refused to set up two more computers and printers and continue the madness. I can’t imagine why…but we began to work with a publisher close to the store where I worked. Now, after five years, I have written thirty-one books, ten patterns, several articles, designed three Cactus Punch Signature Series design collections, working on more…taught in hundreds of sewing machine stores, given seminars at conventions, worked in Canada and Spain and it just keeps growing. I will be publishing two more book CD combinations in August and some more new design disks and patterns. The list gets longer and longer. And I have you to thank for all of it. Without you coming to the seminars and purchasing the books, I would still be behind the counter, selling sewing machines. Oh yes, I resigned from my job in August of 1999…and my husband sold the girls, I mean the dairy cows in March of 2000. So we are a full time business couple.